Spice Traveler is your gateway to cooking & eating food that tastes great & is good for you! Our mission at Spice Traveler is to provide the freshest dried herbs and spices available, at reasonable prices. This way, it’s easy for you to stock up on excellent quality basics, like Basil and Cinnamon, and easily try things that may be new to you, like Galangal root or Annatto seed. 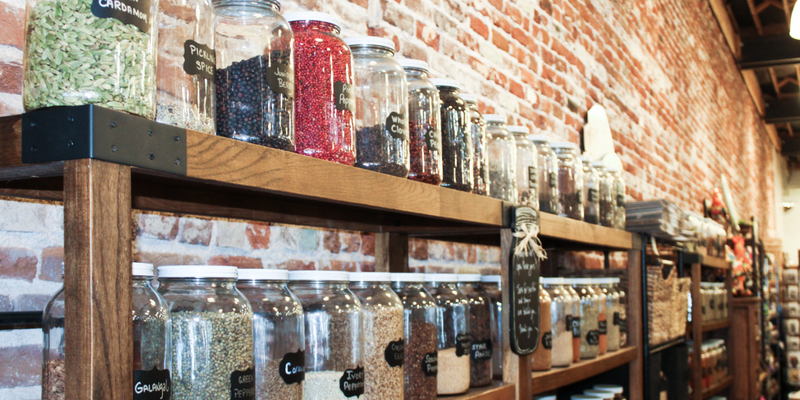 Centrally located in downtown Prescott, our store is perfect for adventure seekers, with flavors from around the world. We're passionate about cooking up new ideas, and we believe that any meal can be an exciting journey of its own. We are locally owned, so when you visit us, you’re seeing the ‘world headquarters’ of Spice Traveler. Spice Traveler is partnered with the folks at Olive U Naturally, located in Bashford Court in Prescott. Together, we’ve got what you need to make delicious dishes that won’t take over your budget or your time. We hope you'll grow to love cooking like we do and then you’ll want to spend more time in your kitchen! Most of all, we want you to have fun when you visit us! When you come into the store it’s a sensory adventure, with sample jars to sniff, new flavors to discover, stories and recipes to be shared. We genuinely enjoy meeting each and every visitor, and we hope to see you soon. We also want to convey our thanks to all of our current “Spice Travelers” who have come in again and again, and brought new friends! We truly appreciate your enthusiasm for the shop! We couldn’t do it without you!